aFe Pro-Guard D2 Oil Filters are the next generation in oil filter technology. This oil filter is constructed with extreme conditions in mind. A heavy duty 600lb. 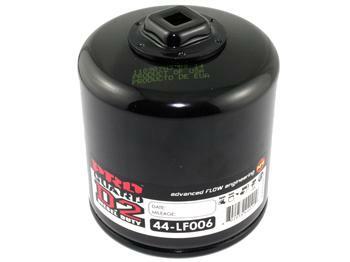 burst strength canister with a 3/8” nut/ratchet drive is built in to the filter for easy removal. The inside of the filter uses a NF21 synthetic composite material which provide maximum engine protection with minimal flow restriction. Heavy duty coil spring, wire backed media, center tube and .100 thick base plate provides maximum strength. The Pro-Guard D2 Oil Filter outflows and has a high filter efficiency than all other oil filters on the market today.